Bunting and Fans for your home, company gatherings, parades, business, or other use limited only by your imagination. We break these out for our summertime parties, but they are equally at home in the warehouse, on your parade float, or anywhere you want that Patriotic flair. Nylon pleated fans, fully sewn without stars, now available in five sizes. Possible uses include decks, porches, balconies, fences, meeting rooms and more limited only by your creativity. Choose fully sewn with printed stars in standard 3'X6' size. Each fan features a canvas header and brass grommets along top edge as shown. Choose style and size here. Cotton pleated fans: Possible uses include decks, porches, balconies, fences, meeting rooms and more limited only by your creativity. Choose fully printed without stars, in two sizes or fully printed with stars in three sizes. Each fan features a canvas header and brass grommets along top edge as shown. Choose your style and size here. "Americana" Fan is a fun addition to your Patriotic decoration collection. This fan is constructed of fully printed lightweight polyester offering suberb color retention. Each fan features a canvas header and brass grommets along top edge as shown. Measures 3'X6'. Nylon pleated half fan set, fully sewn without stars, in standard 3'X3' size. Each half fan features a canvas header and brass grommets along top edge as shown. Sold in sets of two. These fan drapes of pleated nylon make an impressive impact by themselves or as a focal point with other fans, flags or bunting. Possible uses include decks, porches, balconies, fences, meeting rooms and more limited only by your creativity. Each fan drape features a canvas header and brass grommets along top edge as shown, sewn stripes and printed center panel. Measures 3'X9'. Style #1 is shown on left above, Style #2 center and Style #3 on the right. This bunting is constructed of 2 MIL plastic, 36" in width, on a 100 yard roll. With five stripes of red, white and blue, with stars as pictured. Price is per roll. This bunting is constructed of fully sewn nylon and measures 36" in width. Five stripes of red, white and blue with no stars as pictured. May be used indoors or outdoors. Price is per yard. This bunting is constructed of fully printed cotton and measures 36" in width. 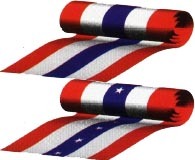 Available with five stripes of red, white and blue, with or without stars as pictured. May be used indoors or outdoors. Price is per yard. Select Stars or no Stars here. This bunting is constructed of fully printed heavy duty cotton and measures 36" in width. Three stripes of red, white and blue with no stars as pictured. May be used indoors or outdoors. This bunting is properly displayed with the blue stripe uppermost. Price is per yard. This banner, known as a "Pulldown" has a plethora of uses. It can be used where use of an actual Flag wouldn't be practical or where space is limited. Ideas for uses can include framing of a large entryway, business lobby, convention or banquet hall, gymnasium, arena, warehouse, against a wall or suspended from above, in any medium to large indoor or outdoor space. Available in three generous lengths, these Pulldowns are made of outdoor nylon with sewn stripes and 50 embroidered stars, canvas headers and brass grommets, just like an actual Flag. Effectively used in pairs or multiples. 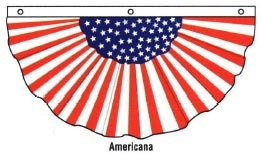 The 'Colonial' banner or the '50 Star' banner, known as a "Pulldown" have a plethora of uses. They can be used where use of an actual Flag wouldn't be practical or where space is limited. Ideas for uses can include framing of a large entryway, business lobby, convention or banquet hall, gymnasium, arena, warehouse, airplane hangar, against a wall or suspended from above, in any medium to large indoor or outdoor space. Either Pulldown is available in 20" width X 8' lengths. These Pulldowns are made of Polycotton sheeting with sewn stripes and printed stars, white canvas headers and brass grommets. Effectively used in pairs or multiples.